Noah Baumbach has always been someone I’ve allowed into my life because of his connection to Wes Anderson, my favorite director, not specifically because I love his individual work. 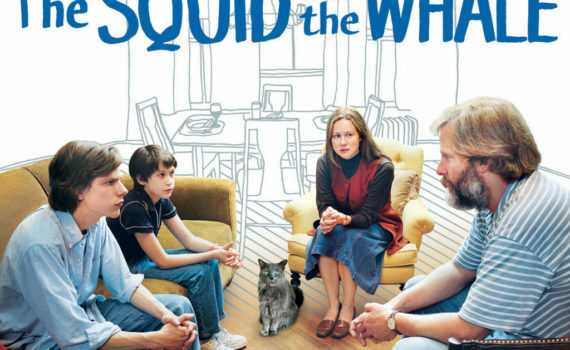 The Squid and the Whale was his first of what I would consider his canon, almost an experience modeled after an Anderson flick before he found his own voice and started doing his Ben Stiller/Greta Gerwig work, which are the films he’s most famous for: Greenberg, Frances Ha, While We’re Young, Mistress America. His most recent movie, The Meyerowitz Stories, is by far his best work, and it seems like he’s finally been able to combine his voice with a style that it more accessible to audiences. But here we revisit the success that got him started, an extremely personal movie that might hit a little too close to home. Living in a family of two literary PhDs and a much younger brother isn’t easy, especially when you’re constantly caught between the superpowers that are your parents, their petty attacks, their massive egos, and the fights that never stop. Walt and his brother Frank are about to become reservable property, shared between their divorcing parents like shelters at a metro park, enjoying the feeling of being wanted but dreading the push & pull. Walt begins despising his mother, insulting his own girlfriend, and lying about original song lyrics, while Frank does much worse; masturbating in school until people think he’s becoming a psychopath. Neither are handling their parents’ breakup very well, while Bernard & Joan Berkman squabble like children and deal with it even worse. My parents are divorced, it happened when I was a teenager, so I understand where Baumbach is coming from, and the reality of his experience bleeds through this film into your living room whether you want it to or not. Write what you know, that’s the best literary advice you’re ever going to get, and that’s why this is Baumbach’s strong start. His girlfriend, Great Gerwig, followed that advice when creating Lady Bird, which is my favorite film of 2017, so I’d say that it’s something every artist ought to remember. Back to Squid and Whale, which is so real it’s uncomfortable, which is the point, almost to a degree where you’d like to turn away. Some of the sexual aspects do become a little unnerving, and some will say Baumbach went too far; that’s for you to decide. But the music, the set, the side actors (Billy Baldwin, Anna Paquin, even Alexandra Daddario has a extra’s role); it all works, it’s a memorable film, and what’s more, I think it’s something that stands out as a movie that needs to be seen at least once in order to understand the entire, and much larger tapestry.